CALTANISETTA, Italy (CNS) — Italian youth lead the lively Sunday worship at St. Pius X Catholic Church in this southern Sicilian town with the help of an African migrant picking up the playful rhythm on a drum. Integrating the migrants into a normal life is one of the goals of the Migrant Project/Sicily, a project of the International Union of Superiors Generals. The nuns from different congregations around the world heeded Pope Francis’ urgent call in 2015 to aid migrants fleeing conflict and poverty. “We call ourselves migrants among migrants,” said Sister Janet Cashman, a member of the Sisters of Charity of Leavenworth, Kansas. She served as a health care worker in the U.S., Peru and South Sudan before taking up this latest calling with Migrant Project/Sicily. 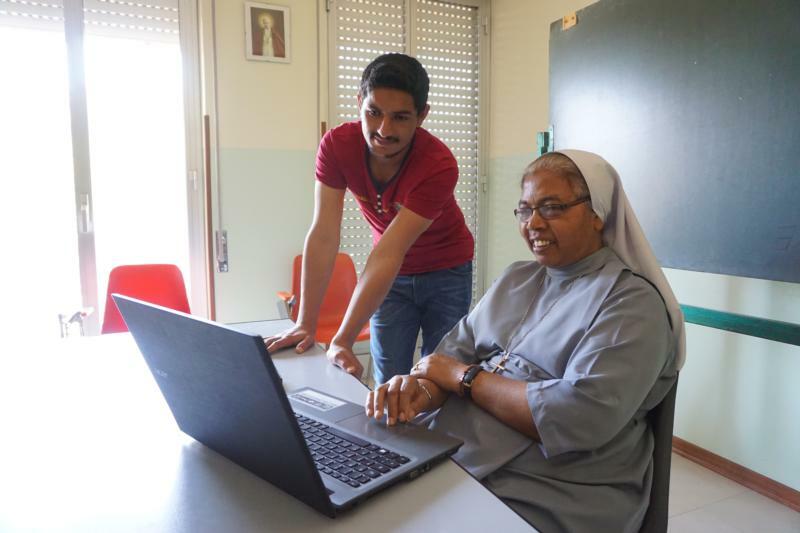 The nuns give practical help and emotional support to scores of migrants flooding Sicily’s shores. The U.N.’s International Organization for Migration said that as of July 3, more than 85,000 migrants — of the more than 100,000 crossing the Mediterranean — landed in Italy this year. “He says, ‘I am going to repair it and I will come back to take you.’ But he never does,” she said. If the stranded migrants are lucky, a kind truck driver will return to collect them after dropping off his passengers. But often the migrants are “left to walk without food or water. So they just dig in the sand with their hands and put the dead bodies below,” Sister Vicky said. “Many say what shows them the way when they are lost are the bones, the skeletons of those who died along the way in the desert,” she said. All of this, just before making the deadly voyage across the Mediterranean, often in unseaworthy vessels — a trip that can cost $5,700. Indian Sister Veera Bara told CNS: “Besides praying with them, we integrate them into our prayers. Their life stories are also heavy for us when we listen to them. “A migrant phoned me saying, ‘Sister, I can’t sleep even though they give me strong medicine. I see my family who were killed coming to me like a trauma every day,'” she said. The religious provide emotional support, teach Italian and translate for the migrants with Italian officials and in hospitals. They also provide meals and warm clothing to those in need as well as conduct catechism classes and hold children’s clubs. “The boat was overcrowded, with some people fainting inside. A lot of heavy waves hit. I saw trousers, caps on top of the water of those who died. Our boat began to sink. We prayed. The rescuers came and lifted us up,” the Nigerian said. “I believed God that I would not die. When we arrived in Sicily, they wrote our names. I found myself in Caltanisetta,” said Wadelwasee, who is housed in a camp of hundreds. He, like other migrants, hope to get papers for residency and work. But the nuns said perhaps only 10 percent of the migrants are accepted. Meanwhile, Pakistani migrant Gishon Payan, 23, says he has no choice but to try to work in Europe to support his widowed mother and eight siblings. He took a loan of more than $10,000 to make the two-month journey by bus and foot to Italy and if he does not pay back the money, his family’s lives are in danger.